Chameleons are challenging, yet fun and rewarding pets to own. They require proper food, housing, and lighting or they can have several health problems. Chameleons can suffer from dehydration, stress and mouth infections. Another common illness for chameleons is eye infections. You should know what an eye infection looks like for your chameleon, some things to try at home and when to take your pet to the veterinarian. Look at the eye for any swelling or discharge. Use a magnifying glass to see if you can find any debris that has gotten into the chameleon's eye. If so, try to remove the debris with some water and an oral syringe. You can flush the chameleon's eye with water to clean it out. Make sure you have proper UVB lighting for your chameleon, as improper lighting can hurt his eyes. Your chameleon will want light on during the day. Talk to an exotic pet shop owner or an exotic animals veterinarian to get recommendations on UVB lighting. Supplement your chameleon's food with beta-carotene and leafy green vegetables. Sometimes, a vitamin deficiency can cause a chameleon to get an eye infection. However, one of the problems with treating an eye infection with supplements/vitamins is that this treatment can take a long time to work properly. Consult a veterinarian while giving vitamin supplements if the eye becomes worse. Take your chameleon to an exotic animals veterinarian or a vet that specializes in reptiles. 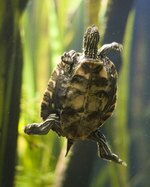 The Association of Reptile and Amphibian Veterinarians website can help you find a vet in your area. A veterinarian may prescribe some topical medication to apply to your chameleon's eye. Make sure to follow application instructions exactly to make sure the eye infection is completely gone even if the eye begins to look healthy. 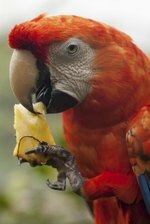 What Types of Fruits & Vegetables Can Birds Eat?